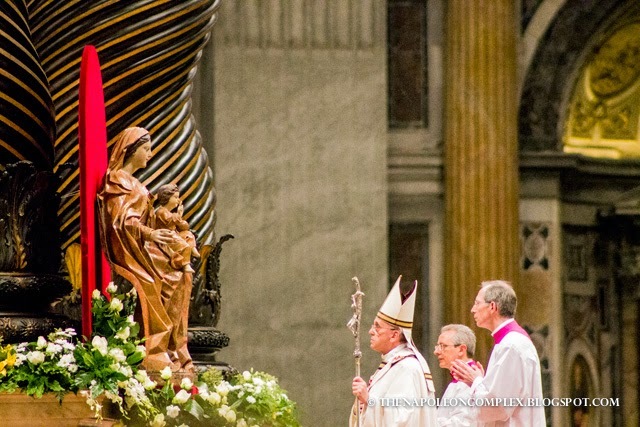 Everything You Ever Wanted to Know About a Papal Mass at the Vatican. Special Announcement: As you know if you follow me on Facebook (hint, hint, you should), I’m finally making the leap to a self-hosted blog with my very own domain name (this is the most exciting part for me!!!). Within the next weeks, at the latest before the new year, I’ll be exporting everything over to my new site, mynapoleoncomplex.com. You can check it out now and see the landing page :). For now, it’s business as usual around here. 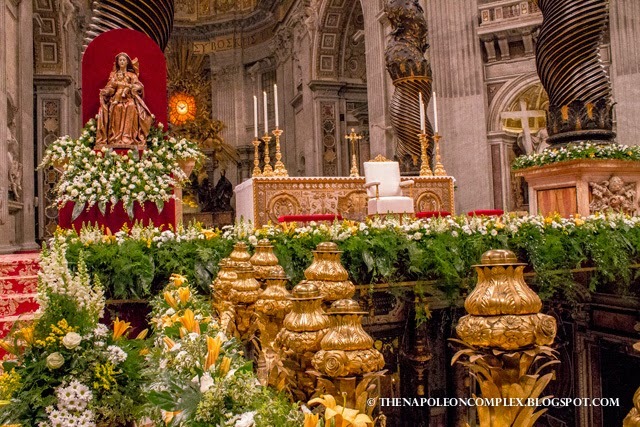 Since we can now say the Christmas season is fully upon us (or, if you’re like Jaime, Christmas season will start on Monday the 8th until January 6th, but he’s no fun), I figured its the perfect time to do an informative post on one of the most special, one-of-a-kind things you can experience in Rome: a Papal Mass in St. Peter’s Basilica. 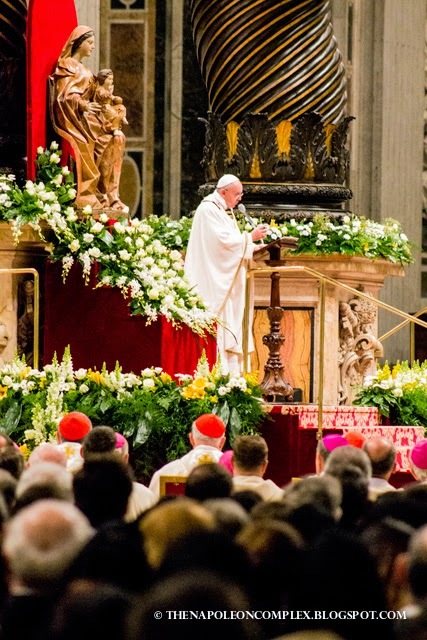 We have been to three papal masses while we’ve been in Rome so we are by no means experts, but hopefully I’ll be able to enlighten you with some of the things we’ve learned along the way. 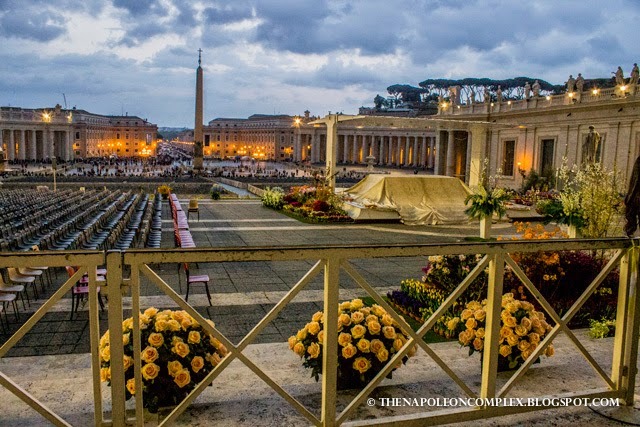 St. Peter’s Square on the night of the Easter Vigil, prepared for Easter Sunday Mass the next day. First things first: Tickets to a Papal Mass are always free. I’ve personally never seen anybody trying to sell their tickets but I’m sure someone, somewhere has tried. For a complete list it is always best to check the Vatican Calendar which, unlike most other websites in Italy, is actually decent and regularly updated. If you’re lucky enough to be in Rome at the time of a papal mass, there are many ways to get tickets. If you’re part of a special group (say embassy or other diplomatic employees), many times it is possible to get tickets through them. If you are planning a group trip with a parish, the Vatican requests you to fill out the regular ticket request form, and attach a letter from your parish. The earlier you request it and the smaller the amount of tickets needed, the greater the chances of your ticket request being accepted. For the two big masses, Christmas and Easter, it is recommended to request tickets no later than two months before. In fact, this year we wanted to attend the Christmas Eve mass since we will be staying in Rome for the holidays, and our ticket request was denied (we requested them sometime in November). If you were unable to reserve tickets in advance, you might still be able to go to the mass! On the day of the mass you can ask the Swiss Guard at the “Bronze Gates” and if there are tickets available, they will give them to you. As a last last resort, if your heart is still set on attending the mass, you can go asking people in the line to get into the basilica for any extra tickets. Tip: I’ve usually seen that the people with extra tickets tend to be in the bigger groups and are usually the priests or nuns in charge. 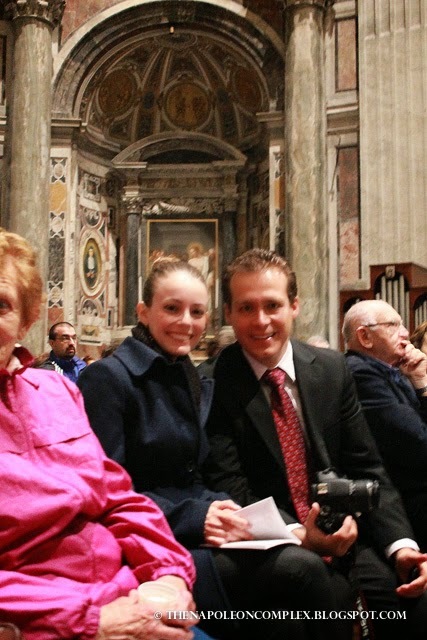 When we went to the Easter Vigil, there was this man behind in us in line who was here all the way from Australia without a ticket and hoping to still be able to enter the basilica. I didn’t have the heart to tell him that the chances of being allowed to enter without a ticket were very slim, but just as we were about to get to the entrance, a ticket literally just flew by and landed at this guy’s feet. I swear this happened. The man was even gracious enough to ask around us to see if anybody’s ticket had flown away but nobody claimed the ticket so he was able to go in! If this isn’t a prime example of the Lord working in mysterious ways, I don’t know what is. For the first mass we went to, New Years Eve last year, this was literally the bane of my existence throughout the month of December. See, the only guideline from the Vatican is that your shoulders and knees must be covered (this is a rule that is followed throughout the year in St. Peter’s). Other than that, there is no explanation on whether to wear a dress or pants or to go casual or to go in dark colors or to go at your most elegant. I’m here to, once and for all, clear up any vagueness about this situation. The first time we went to mass, Jaime dressed up in his best suit, with his best shoes, best tie, best winter jacket. I wore a pencil skirt (slightly above the knee), with black tights, a turtleneck, and my 4 inch heel boots. To Jaime, I was underdressed and breaking church law with my above the knee skirt. But I was allowed in, so I have a theory that black tights (not sheer) are enough fulfill the covered knee rule. It is still up for debate whether skin colored tights also fulfill this rule. Turns out, that I felt at least, that Jaime and I were overdressed. Most people around us were wearing jeans, sneakers, and even the occasional sweatshirt. I kid you not. Now, is it a little disrespectful to go to church (much less the church of all churches) in sneakers and a sweatshirt? Most definitely. Do you need to go in that suit you only wear to funerals and weddings? Absolutely not. As the Vatican likes to remind you, having a golden ticket in your hand does not guarantee entry into the Basilica. Nor does it mean you can get there five minutes before the mass starts like you do every Sunday at your local church. In general, you should plan to be there at least an hour in advance (definitely two if its Christmas or Easter). When you arrive in St. Peter’s Square, it will likely be a little chaotic. If you ask a police officer, or a carabinieri, where to go, most likely they will have no idea, because, hey you’re still in Rome. For the New Years Eve mass, they shut down the entire square a few hours before the mass and people, including us, started lining up at every gate into the square. No one had any idea what was going on or if we were even making the right line. When they finally opened the square, I swear it was like the moment you step into the Hunger Games and all the contestants run to the cornucopia to get supplies. First, the line that we had made for the past hour went to hell and everybody just started pushing to get through the barriers. Once we were past the barriers, then everybody just sprinted to the doors of the basilica. Luckily, maybe the Vatican saw the error of their ways, or maybe thats a special procedure for the New Years Mass, because the other two times we attended, the square was open and there was a much more orderly line to get into the basilica. Beware though that this is Italy and there will always be people trying to skip the line. Don’t let them! The church will be open about an hour before the mass is scheduled to start. There will be some guidance by the ushers but you will have a little freedom to choose where to sit. The prime seats right at the very very front are usually more like mini thrones reserved for the VIPs. How do you know if you’re VIP? Well, VIPs are probably invited personally by the Pope, they probably did not just spend the past two hours standing outside in the cold (or the heat!) to get inside, and they probably have their car parked within Vatican City itself with a chauffeur waiting to drive them home. Hey VIP! 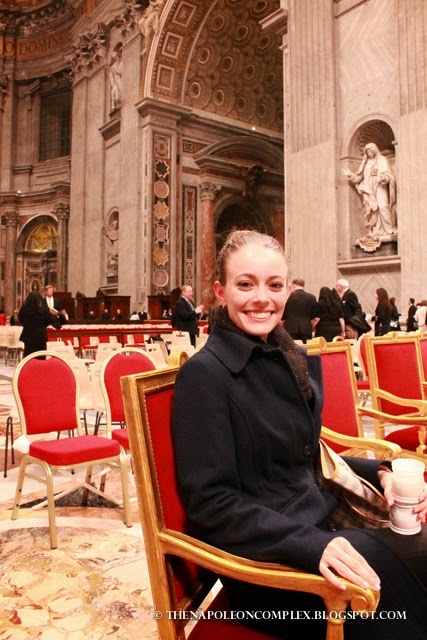 Jk, this was after the mass, when they let you get closer to the altar. Other than that, seats are a free-for-all. They fill up the center of the basilica first, with the inside aisle seats being prime real estate (if you want one of those you better be there making that line early). Then they fill up the sides. By sides I mean the seats directly to the right and left of the altar. I find that those are usually the better seats for closer views without the necessity of being the very first in line. Usually, they’ll be doing the rosary while they wait for the start of the mass. If you’re not Catholic, or if you don’t feel like praying the rosary, you can of course take pictures. In fact, you can take pictures throughout the mass. I mean, you can bring your huge Canon with your five lenses and just go to town. The only thing you can’t do is set up your tripod in the middle of church. 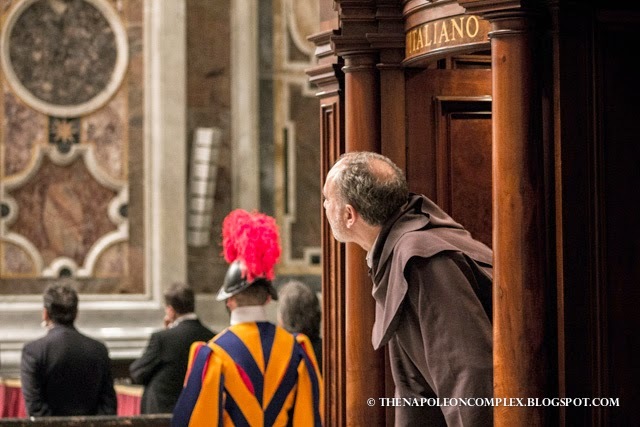 But you can even stand up and walk around (or even stand up on the chairs to get a better view of the Pope as he walks by). These amazing pictures were taken with a long lens with good zoom. We were, unfortunately, not really that close to the Pope. Basically, the point I’m trying to make is that just because its a mass with the Pope in St. Peter’s doesn’t mean that it’s not also a tourist attraction. The holiest of masses turns out to be, in many ways, the least respected. You can make up your own mind about what you think of this, but me? Well, I don’t think people should be standing on chairs in St. Peter’s just to try to catch a glimpse of the Pope’s hat, but there you go. Also keep in mind that a papal mass is not your regular Sunday church mass that lasts for 40-60 minutes and you’re home. 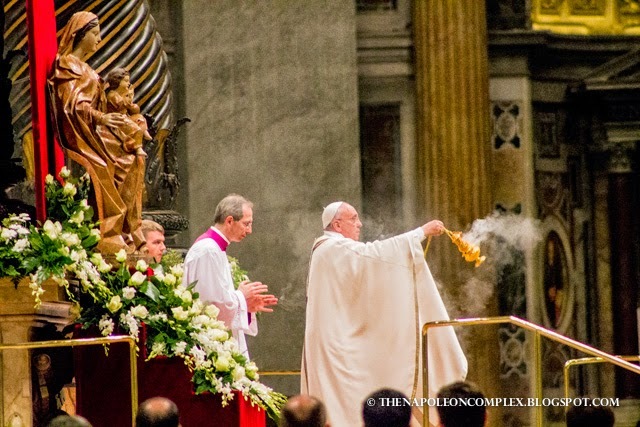 The Easter Vigil lasted for about four hours and even the mass for St. Peter and St. Paul lasted about two hours. 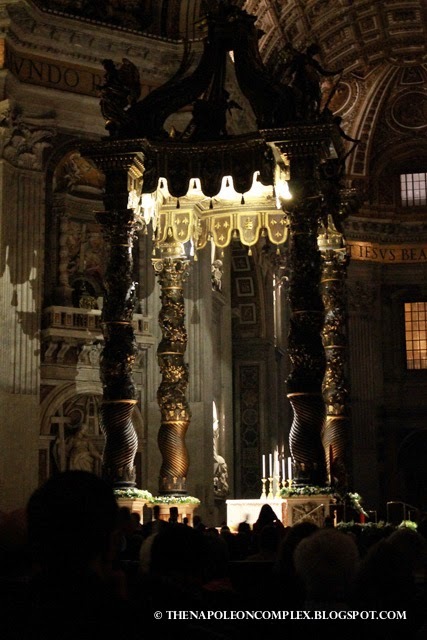 The altar for the Easter Vigil mass. 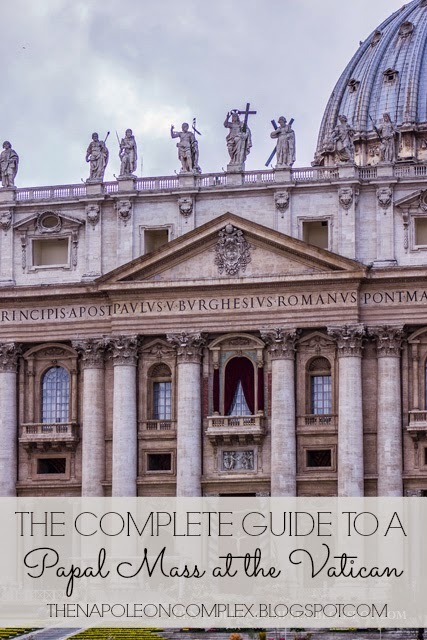 There you have it, your complete guide to a Papal Mass at the Vatican. Could you have gone to the Vatican website for information? Sure, but it definitely wouldn’t have been as candid and full of colorful information as mine is. Even still, here you may find useful and official information on papal masses directly from the source. 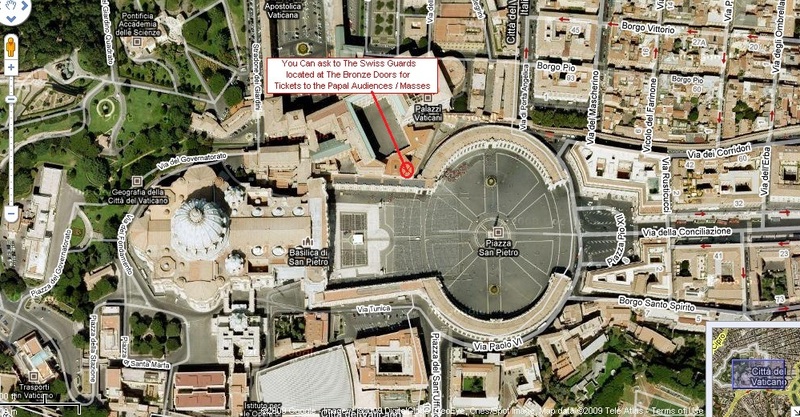 And if there’s no mass when you plan your trip to Rome but you still want to catch a glimpse of the Pope, you can always attend the Angelus every (or most) Sunday at noon or the General Audience at 10:30 am almost every Wendesday (except when the Pope is on summer vaca). I wrote more about those in this post. Ahhhh I love this! I was just finishing up a post on St. Peter’s today and was just still in awe of the church and can only imagine how surrel it must be to attend a papal Mass! Such great information! Great post girl! Congrats on moving to a self hosted site! I’m so excited to see this…the Pope visited South Korea late this summer and while we were very far away, it was quite surreal to be there for such an event! Thanks for linking up to #BYOP! I hope to see you again this week! I see I am three years late to respond, but this is great information! We will be at Easter Mass this year and I am bugging out a bit about what to do! I think the reason people may wear sneakers is so they are able to out run the nuns in their habits! LOL! My kids are track runners, I am hoping that gives us an edge! The way you present insider info is great. Here’s hoping for the best! Thank you ! Interesting ! Oh wow!! This is the only post I’ve found on the Easter Vigil mass. Thanks for all the details. I’ve been living in Rome for 25 years but have never done a papal mass so tomorrow night (4/15/2017) will be a big event. Funny thing is that I requested tickets via fax at the beginning of March but never got a reply. This morning at 9:00 am when I went to presumably pick them up they didn’t have me on the list but with my copy of the request they gave me 3 tickets anyways. I had read somewhere that for those with local addresses confirmation replies were not necessary but the guy behind the desk didn’t really know. (He said another office handled that). He just said: “there is always a solution for everything!” Thank God for that!!! !